Anyways, once I disabled the password, I relaunched the evasi0n tool and started the jailbreak process. It was almost automatic. Once you press the button to start the jailbreak, it restarted the phone once or twice (I don't know because, like always, I went away and did some morning chores.) and when I came back, it was halted at one point. I was supposed to hit the new icon that was freshly installed to the iPhone, named Jailbreak, to proceed. I did so, and the process continued and it was done. It did one final reboot to put things in order. There are few things you have to do before using this tool if you want a successful jailbreak in the first go. Upgrade to iOS 6.1 using iTunes, and not over the air update. If you did the over the air update, do a restore from within iTunes. Do not touch the iPhone once the jailbreaking starts. It doesn't matter if the screen is locked after the initial reboot. The process will continue in the background. Only touch the phone when you are asked to press the Jailbreak icon that's installed to the iPhone. After that, keep away from the phone till the process is finished. Also read the instructions on evasi0n.com website. Also take a look at the following YouTube video. So, thanks to evasi0n tool, you would expect all the jailbreakers to rejoice, right? Wrong. 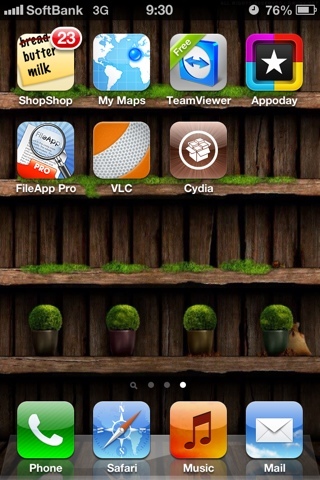 Guess what this jailbreak did to Cydia store. Cydia is virtually unusable right now! Looks like the repositories have become inaccessible due to massive server load. I haven't managed to install a single jailbreak tweak so far. :( I cannot even log into my account to download the paid apps. I guess it will be automatically fixed if we wait patiently. People will eventually give up and the servers will be back on their feet. We waited this long. We can wait one more day, right? It's not evad0r's fault or anyone's fault or that matter. It only proves how many people were looking forward to this jailbreak. The jailbreak community is much much larger than people think. But Apple won't have to worry about this at all. They will still try to show the world that they don't like people jailbreaking their phones. But the truth is that once a jailbreak comes out - especially when the first proper jailbreaking comes out for their flagship iPhone model - they can expect to see a boost in iPhone sales. It's good for them either way. It's would be just as if they released a new phone to the market. Apple has just released version 6.1.1 to the developers and it seems that they haven't fixed bug in iTunes backup which what these guys exploited. But you can never tell if it will be fixed by the time the release version comes out. So be safe. Apple has now released iOS 6.1.1 to the public and the evasi0n jailbreak is still working. You just need to grab the version 1.3 of it to work.